Dandelyan — Located within the Sea Containers house along the River Thames, Dandelyan at Mondrian London features a colorful and tasteful art deco interior. The award-winning bar was named the World's Best Bar and and not surprisingly home to the World's Best Cocktail Menu. With stunning views of the river, it is a perfect place to stop in for a drink or book ahead for Dandelyan's 70s inspired four course Wyld Tea complete with four botanical cocktails. Portrait Restaurant — Housed within the National Portrait Gallery adjacent to Trafalgar Square, The Portrait Restaurant boasts one of the best views of London. In addition to traditional afternoon tea and set lunch menu daily, they also offer a well-priced pre-theatre menu (Thursday - Saturday) and special pricing on restaurant and exhibition ticket packages. Radio Rooftop — Situated ten floors up within ME London, Radio Rooftop offers iconic views of London's skyline. Avoid the crowds and minimum spend in the evenings by making a daytime booking. Afternoon tea is a special treat on the open air rooftop that can be cleverly covered and heated when the weather doesn't cooperate. In case these don't match what you are looking for, check out Affordable Teas with a Twist and Perfect Pairings for more Mum-friendly options. Recognized as the 2018 Tourist Destination of the Year by the Surrey Business Awards, The Watts Gallery – Artists’ Village is an ‘arts and crafts gem’ located in Compton, Surrey. The Gallery is dedicated to George Frederic Watts, one of the greatest Victorian era painters and considered England’s Michelangelo. It is one of the few UK galleries devoted to a single artist and features 100+ paintings and sculptures – many on a monumental scale. G.F. Watts was married to Mary Watts an acclaimed artist, founder of the Compton Pottery and creator of Watts Chapel. The couple lived and worked an increasing amount of time away from London at Limnerslease (‘Limner' word for artist and 'lease' meaning to glean hope for the future), their home and studio located nearby. It was here where Mary taught terracotta classes to the local villagers who created the tiles that decorate the Chapel. The Chapel itself was funded by sales of commissioned portraits painted by GF Watts. Today, guests can visit the Gallery and Chapel and guided tours of Limnerslease. The gift shop located in the former Compton Pottery building features a tasteful collection of products ranging from books, clothing and jewellery to housewares, including replicas of Compton Pottery terracotta pots. With so much to see and everything within walking distance, the tea shop is a perfect place to stop for homemade soups, sandwiches and salads and of course afternoon tea. Another charming place to eat before or after a visit to The Watts Gallery is The Withies Inn — just a 4 minute drive away. Who knew such a small vilage could have so much to offer! Seven Sisters Cliffs are often confused with the White Cliffs of Dover, a series of iconic chalk cliffs covering the narrowest part of the English Channel. The White Cliffs located at the Port of Dover played an important role during World War II by deterring invaders. 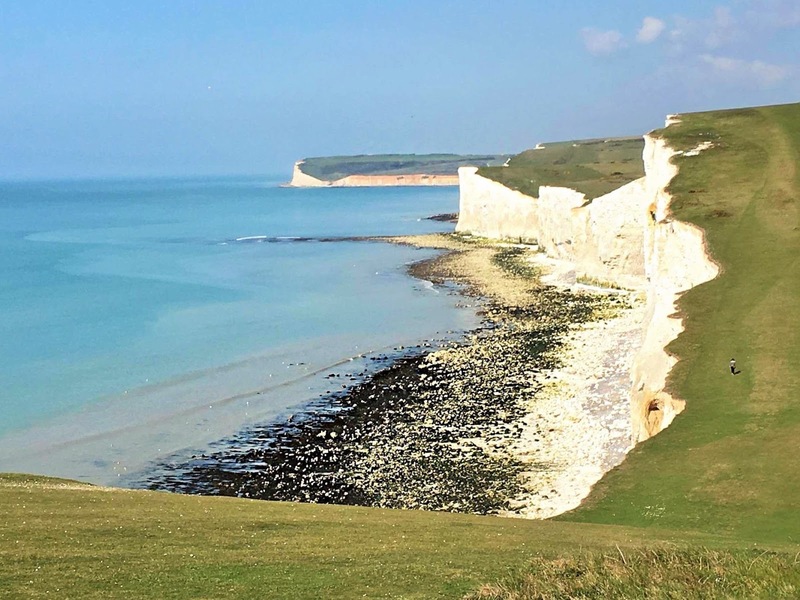 The Seven Sisters Cliffs are particularly striking because they can erode naturally, revealing bright, white chalk surfaces, while the White Cliffs of Dover are impacted by the port (the second busiest one in England) and growing vegetation. As such, Seven Sisters Cliffs has been featured in place of their more famous counterpart in films, including Atonement and Robin Hood : Prince of Thieves. Not surprisingly, the best way to experience Seven Sisters is on foot. While the 5-mile hike is a challenging one with steep hills (look closely at the photos for the people to get a sense of just how high the cliffs are). Needless to say, you will be rewarded with spectacular views throughout. Parking for £4 / car is available at Seven Sisters Country Park Visitor Center in Seaford (post code BN25 4AD). Towards the end of the route, there is a National Trust property at Birling Gap with toilet facilities. From there you can walk to the Crow Link Car Park and catch the #12 bus for £2 / person. The bus runs every 10 minutes back to the Seven Sisters Country Park Visitor Center. Alternatively, you can continue hiking another 3.5 miles back to the Visitor Center. Of course, if you were really inspired (and the weather cooperated), you could continue on the South Downs Way, a 100-mile walking trail that leads all the way to Winchester!